La Belle Assemblée, January 1807. As is typical with Ball Dresses, the hemline is much higher than other dresses of this time, presumably for ease of dancing. 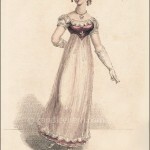 I doubt, however, that actual dancing dresses were ever quite as short as they are portrayed in fashion plates. 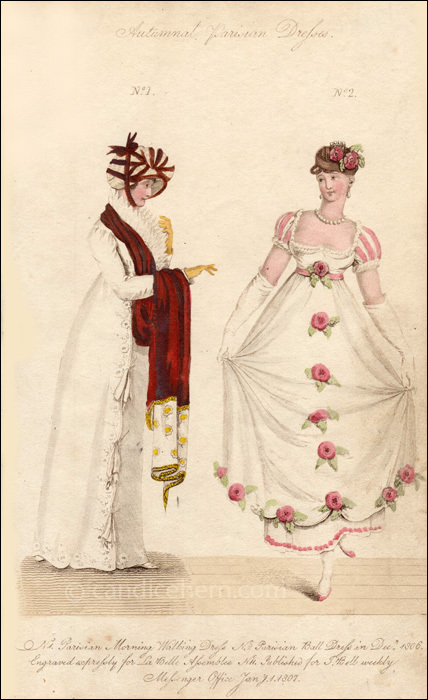 Both dresses are inspired by prints from the French publication Journal des Dames et des Modes, but are not exact copies, as they often are. “No. 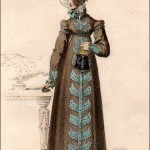 1.–MORNING WALKING DRESS. Of twill sarsnet, cambric, or velvet, embroidered round the bottom and up the right side, where it confines the front which wraps under it, with three bow and ends of correspondent ribband; long waist, with robin fron; and long sleeve, nearly to fit the arm. An erect Vandyke ruff, sloped to a point at the extremity of the waist, terminating with a steel clasp, which secures the belt. An Indian Scarf, or long shawl of crimson, with diversified ends, and border, thrown loosely over the shoulders, and negligently supported by the right hand. A poke bonnet, or woven willow, or fancy straw, blended with crimson velvet; bows of the same in front, edged with velvet; a band of the same passed under the chin, terminating in a bow and ends on the crown. Hair cropt behind, and formed in close curls in front. York tan gloves, and kid shoes.